On 29, 30 and 31 January 2017, VINISUD invites all Mediterranean wine professionals to attend the first edition of a henceforth annual trade show. The event will offer several innovations to strengthen services to professionals and the dynamism of business relations at the fair. over 20,000 visitors are expected, including 6,000 international visitors from 70 different countries. Amongst them will be 400 major buyers who are key stakeholders in their markets, including 200 VIP buyers recruited by Sud de France for the International Business Forum. VINISUD 2017 will also be attended by nearly 1,000 exhibitors, including all inter?branch organisations. In 2017, VINISUD will continue to serve the sector’s stakeholders by creating tools to facilitate trade relations, offering new events and identifying future trends. A PERSONAL WELCOME for buyers at the fair. MEDITERRANEAN WINE TOURISM by VINISUD: the first area devoted to Mediterranean wine tourism, organised in conjunction with Winetourisminfrance.com, providing an exhibition area, kiosk and three round table discussions. In partnership with WINE INTELLIGENCE, VINISUD has created the first International Observatory of Mediterranean wines, reflecting the dynamism of Mediterranean wines throughout the world. In collaboration with SOWINE and SSI, VINISUD has published an exclusive and highly instructive survey,carried out in London and New York, on the wine consumption trends of Millenials (21?35 year?olds). L’ESPACE EXPRESSION MEDITERRANEENNE by VINISUD, which showcases Mediterranean grape varieties and the region’s rich winegrowing heritage. The DIGITAL HUB, digital heart of the fair's eco?system and a place for dialogue and interaction under the guidance of the SOWINE team. It is dedicated to discovering new international trends in digital communication. The exhibition held its pre?launch as an annual event in Paris on November 24th, by presenting the first results of two new studies, which look at Mediterranean wines in the global marketplace and consumption habits among young wine drinkers in London and New York. THE INTERNATIONAL OBSERVATORY OF MEDITERRANEAN WINES, carried out in partnership with Wine Intelligence, is the first study to give a precise overview of the production and markets of 17 countries inside and outside the EU and the dynamism of Mediterranean wines throughout the world. Key figures include the fact that Mediterranean countries produced 77Mhl of wine in 2014, 28.4% of total world production. In terms of specific markets, the study gives for the first time specific data for the South of France by separating out only the AOCs and IGPs in the south (AOPs Languedoc Roussillon, Rhone Valley, Provence, Corsica, and the South West. IGPs Pays d’Oc, South East, Languedoc Roussillon not Pays d’Oc and the South West). The study shows that production from the South of France represents 52% of national French production at 19.2Mhl (2014). Although the study shows Germany to be largest market, those showing the most growth are the UK and the USA. China has the highest growth (+46%). The UK and US are the leading contributors to growth: +9% and +8% respectively (lower growth than China BUT from a higher base). The UK is the 3rd largest market for Mediterranean still wines, which represent one bottle in three of all imported still wines. In 2015 the UK imported 14 Mhl of still wine (+8.1% vs 2013) of which 4.6 Mhl were Mediterranean wines (+9% vs 2013). Exports have been driven over the past 2 years by sparkling wines that account for 49% of global sparkling wine exports. The study confirms the UK as the number one export market for sparking Mediterranean wines: (1 Mhl in 2015, +75% vs 2013), of which 0.8 Mhl were Prosecco. 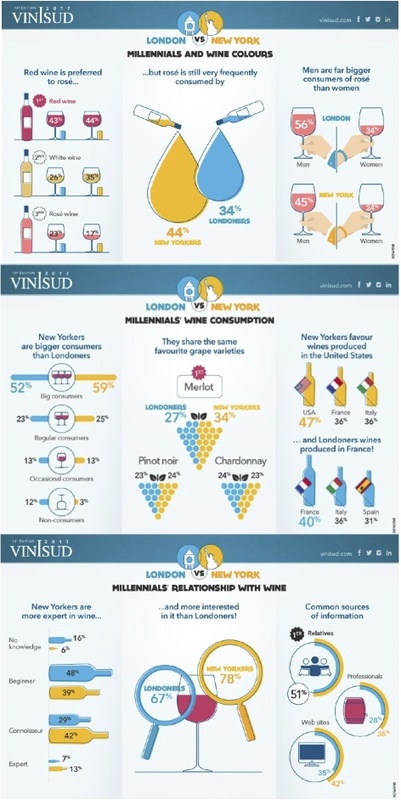 Reflecting the importance of the UK and USA, VINISUD (in collaboration with the SOWINE agency and SSI) has also published an exclusive survey, LONDON v. NEW YORK CITY, on the wine consumption trends of Millennials (21? 35 year-olds). The online survey reveals that although red wine is the preference for men and women in both cities, followed by white then rosé, 44% of young New Yorkers and 34% of young Londoners drink rosé several times a week. Surprisingly, men said they were far bigger consumers of Rosé than women (56% vs 34% in London and 45% vs 24% in New York). Men were also shown to be bigger consumers of sparkling wine (excluding Champagne) on a regular basis, than women: 54% male New Yorkers as opposed to 27% females and 34% London men as opposed to 22% women. Merlot was the favourite grape on both sides of the Atlantic, followed by Pinot Noir and Chardonnay in second place. While the majority (47%) of New Yorkers favoured US wines, Londoners named France as their favourite country of origin (40%) followed by Italy and then Spain. According to the survey, young New Yorkers are bigger consumers than their counterparts in London (59% of New Yorkers say they drink wine several times a week as opposed to 52% of Londoners) and while 42 % of New Yorkers describe themselves as connoisseurs, only 29% of Londoners say so, with most (48%) describing themselves as ‘beginners’. On both sides of the pond, friends and family were the main sources of information on wine (51% in New York and London), followed by websites and advice from the wine trade. The final part of the survey, which looks specifically at millennial attitudes to Mediterranean wines, will be presented at VINISUD in January.